Throughout the past week, I’ve been thinking a lot about how I might support my own efforts and intentions in developing a “positive path” …figuring out what personal habits might be limiting or impeding progress on that “positive path,” what “habits” or “patterns” I might benefit from “letting go of,” learning to shift into the opposite, positive quality or pattern….all with the purpose and intention of nurturing, developing and moving along a positive path. I’m sharing these “thinking strategies” I came up with, in case others might be doing similar thinking or strategizing…no matter what each of our chosen “paths” might be…perhaps there are similar strategies to help limit the challenges and then nurture and develop the positives. I specified my own “qualities”…perhaps others might use these ideas as a springboard and replace my ideas with your own. As I thought about “patterns” that seem to be limiting my own progress, I figured out several very basic areas of concern: way too much clutter in the house, so needs for more simplicity and organization; cautiousness when thinking about trying new endeavors or contacting new people, so needs for taking more chances, flexibility, confidence; being a bit hard on myself, so needs for more kindness, acceptance and appreciation of positives I might have. I found that focusing on the positive aspect was far more helpful than focusing on the problem “habits” …but awareness of what those challenges are, seems to be important and helpful…for becoming more alert and recognizing them in the moment, but then immediately shifting and focusing on the opposite, “positive habit” or “desired, positive outcome” ….this is an important step, but am being careful to just focus on “letting it go” rather than being negative or critical about it. The goal: nurturing and developing the qualities in the left column by becoming more aware of and letting go of the challenges in the right column. Those lines resonated with me. I think many of us do have our own “promises” to keep: to ourselves, to others, to our spiritual paths, to the earth, to the world…each of us with our own hopes, abilities, aspirations, dreams and “promises,” spoken or unspoken. I think we also hopefully have “miles to go before we sleep”…so much be done, unknown amounts of time to do it, lots of wonderful progress to be made, lots of positive contributions to be attempted… “miles and miles to go before we sleep” …and so, for each of us to nurture, develop and value our own positive paths…while we are here, while we are able, while we can make positive differences and contributions. 3 weeks later, January 24: progress indeed…. increased awareness and acknowledging seems to be increasing “progress”….this “idea” seems to work….wow, I’m a bit surprised. This entry was posted in Awareness, Intention, Motivation and tagged Awareness, Courage, Encouragement, Inspiration, Intention, Life, Mindfulness, Motivation, Persistence, Strength, Wisdom. Bookmark the permalink. This is a wonderful guide to focusing on the positives while letting go of the negatives. Reminds me of cognitive psychology. Sometimes, (or most times, I confess) I focus on my negatives instead of my positives but I am willing to let this go. It’s time for change! Love the photos and poem …. 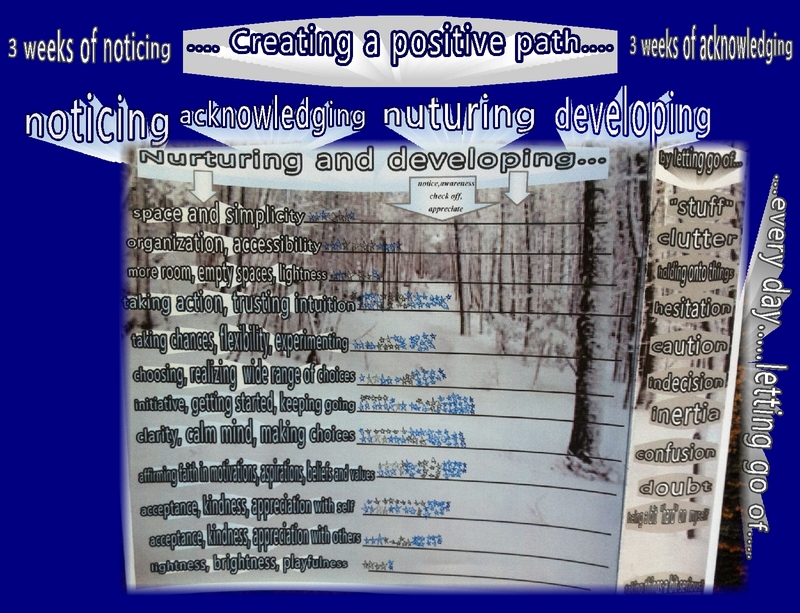 btw I chose the photo and created the pages before thinking at all about the poem…(in fact I used it as a background for a poem I’m going to add to my aunt’s blog..about how much she loved winter/snow/cross country skiing), but I’m guessing that at some intuitive level I had some awareness of the “positive path” ideas coming together with those ending lines of the poem…and then…boom!…they came together! Thank you for the link to Yaz’s blog…I’ll go read her ideas. I learn so much from other people’s blogs…what an amazing community! I am paying attention to how I think… I am taking notes right now, so thanks for sharing this as it helps me as well! Wishing you well… I hope you notice lots of positives. 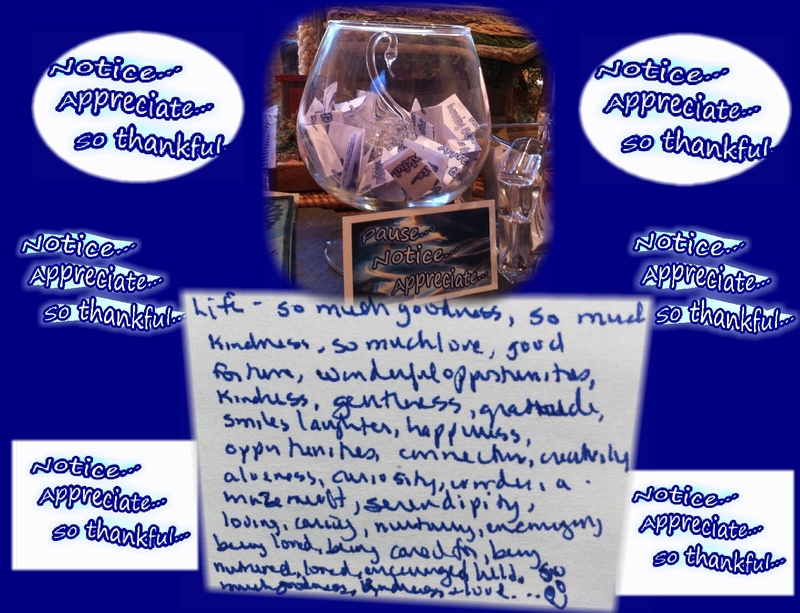 I’ve been encouraged, if/when noticing “less than positive” thoughts, to simply let them go and appreciate and be thankful that I’ve tried so hard and am developing more alert awareness in the moment… took awhile to sincerely develop a sense of thankfulness, but it really, really helps! Thanks Robin. I’m trying to be careful about how many pattens/habits I’m trying to walk away from…. (ahh, patience)… choosing just a few that seem to be complicating things right now in my everyday life. And as I wrote, just above, to Marie, I’m noticing that focusing on using the opposite quality of the “negative” seems to be leading to some very positive energy! Wow..nice surprise! Being home (retired) is like a new job…noticing previously unobserved patterns/habits and somewhat unfamiliar challenges…. a seemingly “new” me, with unexpected challenges and strengths….who is this “Kathy”???? Ah, so much to learn! Kathy, very insightful and helpful post! I can attest to the positive changes in the last day or two. Nice! Thanks, Peter (Peter is Kathy’s husband)… aren’t these “changes” something? ?…I’m still a bit surprised! And you’re right there with the positive “shifts,” too…wow! I have been reflecting too on how to navigate an additional layer to the positive energy that I have held a strong faith since a young teen. It is impressive, I am finding that there are more and more people finding that their faith and hope can be elevated by a strong energy of positivity;. instead of seeing it as a threat as it was once in the past.. I am delighted to see all this graciousness coming together as one collective spark of light~ to see the the shining light through the eyes of those who found their path is exhilarating. And we are part of this Kathy!~ zThank you. I love the Robert Frost poem – thanks for reminding me of it. My daughter recited it at a festival when she was about ten. I think she placed third. Funnily enough I’ve spent the past couple of months cleaning out my house – not just books, and papers, but when you look you discover old computers and printers and DVD players … I’ve already made several trips to Goodwill. De-cluttering feels so cleansing! I agree… it’s a wonderful poem. I wonder if the ideas in the poem resonate with your daughter, or if, at some point they will? Isn’t it a wonderful feeling to get de-cluttered? Congratulations to you! You’re way ahead of me, but I have made lots of progress this week…creating and looking at these pages seem to have given me some really positive, energy! (I’ve been using that last page that I added this morning… kind of like a little kid…making little stars beside the areas that I do…it seems to help! Thanks Debra…. I used the ideas and “pages” to help “un-tumble” my own priorities and thoughts. I hope the ideas help you out, too.